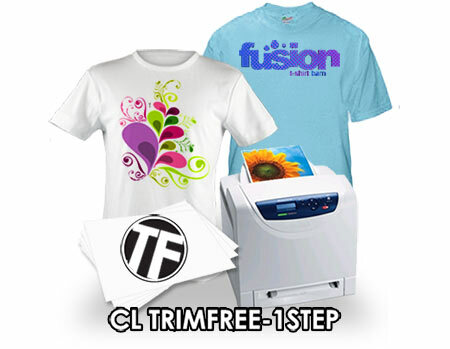 "CL TrimFree-1Step" Heat Transfer Paper For Oil & Non-Oil Laser Printers & Copiers (see instructions for recommended brands). This transfer paper is a unique, single-step self weeding transfer paper for white and light colored fabrics. TrimFree-1Step will run without exception on both oil and non-oil color laser copiers and printers (see instructions for recommended brands/not for use in HP or Brother). Developed to leave ZERO background in the unimaged areas of the design, TrimFree eliminates the need for trimming the image prior to pressing. Ideally suited for full color logos or artwork, TrimFree-1Step can be applied to cotton, cotton blends, 100% polyester, leather and more. SEE SILICONE PARCHMENT PAPER BELOW! Must be applied by Heat Press only!